Obesity is associated with impaired glucose tolerance which is a risk factor for cardiovascular risk. However, the oral glucose tolerance test (OGTT) is not usually performed in patients with normal fasting glycaemia, thus offering false reassurance to patients with overweight or obesity who may have post-prandial hyperglycaemia. As an alternative to resource demanding OGTTs, we aimed to examine the predictive value of anthropometric measures of total and central fat distribution for post-prandial hyperglycaemia in patients with overweight and obesity with normal fasting glycaemia enrolled in the DICAMANO study. We studied 447 subjects with overweight/obesity with a fasting glucose value ≤ 5.5 mmol l−1 (99 mg dl−1) and BMI ≥ 25 kg/m2 who underwent a 75-g OGTT. Post-prandial hyperglycaemia was defined as a glucose level ≥ 7.8 mmol l−1 (140 mg dl−1) 2-h after the OGTT. The anthropometric measurements included body mass index, body adiposity index, waist circumference, neck circumference, waist-to-hip ratio and waist-to-height ratio. The prevalence of post-prandial hyperglycaemia was 26%. Mean 1-h OGTT glucose levels, insulin resistance and beta cell dysfunction was higher in those subjects in the highest tertile for each anthropometric measurement, irrespective of fasting glucose level. Central fat depot anthropometric measurements were strongly and independently associated with an increased risk of post-prandial hyperglycaemia. After multivariable-adjustment for fasting plasma glucose level, smoking, and physical activity level, the odds ratio (95% confidence intervals) for the presence of post-prandial hyperglycaemia for neck circumference, waist circumference and waist-to-height ratio were 3.3 (1.4, 7.7), 2.4 (1.4, 4.4) and 2.5 (1.4, 4.5), respectively. In this large and comprehensively phenotyped cohort, one in four subjects had post-prandial hyperglycaemia despite normal fasting glycaemia. Anthropometric indices of central fat distribution were strongly and independently associated with an increased risk of post-prandial hyperglycaemia. These results support the association between central adiposity and glucose derangements and demonstrate the clinical usefulness of anthropometric measurements as screening tools for the selection of patients who are most likely to benefit from an OGTT. Evidence from well-conducted observational studies supports testing for prediabetes and risk for future type 2 diabetes mellitus (T2DM) in asymptomatic adults with overweight or obesity and who have one or more additional risk factors for T2DM . In addition to glycated haemoglobin, the 2-h oral glucose tolerance test (OGTT) represents the basis for screening and/or diagnosis of post-prandial hyperglycaemia. Impaired glucose tolerance is a risk factor for cardiovascular disease . However, despite the fact that 40% of subjects who develop T2DM have normal fasting glucose at baseline , there is still controversy as to whether these patients should undergo an OGTT. Moreover, due to resource demands, the OGTT is not routinely performed in patients with normal fasting glucose, thus potentially missing patients with post-prandial impaired glucose tolerance or frank T2DM. This raises the unmet need for readily available and inexpensive markers that can be used to screen patients that are most likely to have post-prandial hyperglycaemia and therefore benefit the most from an OGTT. These patients could benefit from lifestyle interventions designed to reduce insulin resistance and preserve β-cell function in an attempt to prevent T2DM. Anthropometric measurements, such as body mass index (BMI), body adiposity index, neck circumference, waist circumference, waist-hip-ratio or waist-to-height ratio, are simple, reproducible and inexpensive tools that can be used as surrogates of central adiposity. To the best of our knowledge, no previous study has determined their predictive value for post-prandial hyperglycaemia (impaired glucose tolerance and T2DM) in patients with overweight or obesity with normal fasting glycaemia . Therefore, in the present study we comprehensively phenotyped a large cohort of patients with overweight and obesity enrolled in the “Discovering Carbohydrate Metabolism Alterations in Normoglycemic Obese patients study” (DICAMANO); clinicaltrials.gov identifier NCT03506581) in order to assess the prevalence of post-prandial hyperglycaemia in individuals with normal fasting glycaemia and examine the predictive value of anthropometric measurements as screening tools for the selection of patients who are most likely to benefit from an OGTT. Subjects aged 18–70 years, who attended the Department of Endocrinology and Nutrition of the Clínica Universidad de Navarra from 2009 to 2014 for a check-up were offered to participate in the DICAMANO study; 853 subjects agreed to take part. Only those individuals with a normal fasting glucose level (≤ 5.5 mmol l−1) and BMI ≥ 25 kg/m2 were analysed. Subjects with previous T2DM or severe renal, liver or thyroid dysfunction were excluded (Fig. 1). Participants were instructed to temporarily discontinue any medication known to affect glucose or lipid metabolism for 48 h. On the day of the study visit, each subject had a complete routine clinical assessment to evaluate the presence of cardiovascular, respiratory, renal or endocrine disorders. All patients underwent a 75-g OGTT with a concomitant anthropometric study, blood pressure monitoring and lipid profile analyses. They were classified by glucose tolerance on the basis of blood glucose levels according to ADA diagnostic criteria for T2DM (2017) . Post-prandial hyperglycaemia was defined as a 2-h OGTT glucose level ≥ 7.8 mmol l−1 (140 mg dl−1). The experimental design was approved, from an ethical and scientific standpoint, by the Research Ethics Committee of the University of Navarra Clinic. Written informed consent was obtained from all participants. Anthropometric measurements as well as venesection were performed on the same day. All measurements were performed with participants dressed in light clothing and barefoot. Height was measured to the nearest 0.1 cm with a Holtain stadiometer (Holtain Ltd., Crymych, UK), while body weight was measured with a calibrated electronic scale to the nearest 0.1 kg. Waist circumference was measured at the midpoint between the iliac crest and the rib cage on the mid-axillary line, and hip circumference at the level of the greater trochanters was measured to the nearest millimetre using a flexible tape. Total body fat was evaluated by BMI (kg/m2) and body adiposity index ([hip circumference/height1.5] − 18), which has been shown to correlate very well with body fat percentage measured by dual-energy X-ray absorptiometry . Body fat distribution was evaluated by waist-to-hip ratio (waist circumference divided by hip circumference) waist-to-height ratio (waist circumference divided by height) and neck circumference. In addition, the physical activity level (PAL) was estimated by a validated questionnaire taking into account physical activity at home, at work and daily leisure time . Blood samples were collected after 10–12 h overnight fast. Serum glucose was analysed by an automated analyser (Roche/Hitachi Modular P800), with quantification being based on the enzymatic colorimetric reactions described by Trinder . Insulin was measured by means of an enzyme-amplified chemiluminescence assay (IMMULITE®, Diagnostic Products Corp., Los Angeles, CA, USA). All participants underwent a 2-h OGTT with an oral bolus containing 75 g of anhydrous glucose. Blood samples were obtained at 0, 30, 60, 90, and 120 min for the measurement of glucose and insulin concentrations. Basal insulin resistance was calculated by the homeostasis model assessment of insulin resistance index (HOMA-IR = fasting insulin concentration (I0) * fasting glucose concentration (G0))/405) and the Quantitative Insulin Sensitivity Check Index (QUICKI = 1/[(log(I0) + log(G0)]) . Whole-body insulin sensitivity was estimated by the Matsuda index (insulin sensitivity index (ISI) as 10,000/sq rt of [G0 * I0] * [mean glucose concentration * mean insulin concentration during the OGTT]) . ß-cell function was estimated by the Disposition Index (DI), a measure of insulin secretion during the prevailing level of insulin action relative to the degree of insulin resistance (ΔI0 − 30/ΔG0 − 30 * 1/I0) . For each anthropometric measurement, patients were categorized according to tertiles, with the lowest, second and top tertiles labelled low, intermediate, and high categories, respectively. BMI that was categorized into three predefined tertiles (< 30 kg/m2, ≥ 30 kg/m2 to < 35 kg/m2, and ≥ 35 kg/m2). Descriptive statistics were computed for all variables based on the categories mentioned above. Mean 2-h OGTT glucose levels by anthropometric tertiles were compared using analysis of covariance (ANCOVA) to adjust for fasting glucose concentrations. We used logistic regression models to evaluate the association between the anthropometric measurements and the risk of post-prandial hyperglycaemia. The lowest tertile of the anthropometric measurements served as the reference category. The odds ratios (OR) and their corresponding 95% confidence intervals (95% CI) were additionally adjusted for age, gender, fasting plasma glucose level, and traditional cardiometabolic risk factors, including smoking and physical activity level. Statistical evaluation of the potential modification effect of gender was evaluated. Mean age was 41 years and 65% of the patients were women. All 447 patients had overweight or obesity with a median BMI of 33 kg/m2. Despite the normoglycemic baseline status of the 447 patients examined, 114 (25.5%) had post-prandial hyperglycaemia, 101 (22.6%) had impaired glucose tolerance and 13 (2.9%) T2DM. Demographic and clinical characteristics of the study population by tertiles of anthropometric measurements are presented in Table 1. Patients with higher anthropometric measurements were significantly more likely to be men. Fasting plasma glucose levels ranged from 3.7 to 5.5 mmol l−1 (66–99 mg dl−1), and were similar across tertiles of anthropometric measurements. Higher levels of anthropometric measurements were associated with significantly higher HOMA-IR levels, lower insulin sensitivity index, and lower ß-cell function (Table 1). Figure 2 shows the variation of plasma glucose during a 2-h OGTT stratified by tertiles of anthropometric measurements. Mean 2-h OGTT glucose levels gradually increased across categories of each anthropometric measurement, irrespective of fasting glucose level (Fig. 2; Additional file 1: Table S1). One-hour post-prandial glucose levels were significantly higher at the higher anthropometric measurements tertiles (Additional file 1: Table S1). Those subjects with a 60-min glucose ≥ 8.6 mmol l−1 (mg dl−1) had the worst lipid profile, greater rates of hypertension and non-alcoholic fatty liver disease, higher insulin resistance and ß-cell dysfunction as compared to subject with normal 1-h value (Table 2). The highest anthropometric measurements were associated with an increased risk of post-prandial hyperglycaemia after multivariable adjustment. The highest correlation with post-prandial hyperglycaemia was found among those anthropometric measurements assessing fat distribution (waist-to-hip ratio, waist-to-height ratio and neck and waist circumferences) as compared with those surrogates of total body fat (BMI and body adiposity index) (Table 3). Compared with the lowest category of BMI, the age and gender-adjusted OR (95% CI) were 1.4 (0.8; 2.6) and 2.0 (1.1; 3.5) for the intermediate and high category of BMI, respectively (Table 3). Further adjustments for fasting plasma glucose level, smoking, physical activity and gender did not significantly alter these ORs. With regards to the body adiposity index, despite the fact that the highest category showed greater risk of post-prandial hyperglycaemia, this association was not statistically significant (Table 3). Neck circumference was significantly associated with an increased risk of post-prandial hyperglycaemia with an unadjusted OR (95% CI) of 3.3 (1.9; 5.7) for the highest category, compared with the lowest one. Further adjustments for age, gender, fasting glucose level, smoking, and physical activity did not alter the significance of this association. (Table 3) The multivariable-adjusted OR (95% CI) for the highest categories of neck circumference was significantly higher in men compared to women at 4.0 (1.3; 12.5) and 1.4 (0.4; 4.9), respectively. Waist circumference, waist-to-hip ratio and waist-to-height ratio were also significantly associated with the risk of post-prandial hyperglycaemia, although with lowest OR compared to neck circumference. The multivariable-adjusted OR (95% CI) for the highest categories of waist circumference, waist-to-hip ratio and waist-to-height ratio were 2.4 (1.3; 4.4), 2.3 (1.2; 4.7), 2.5 (1.4, 4.5), respectively (Table 3). No evidence for an interaction effect between them and gender was observed. 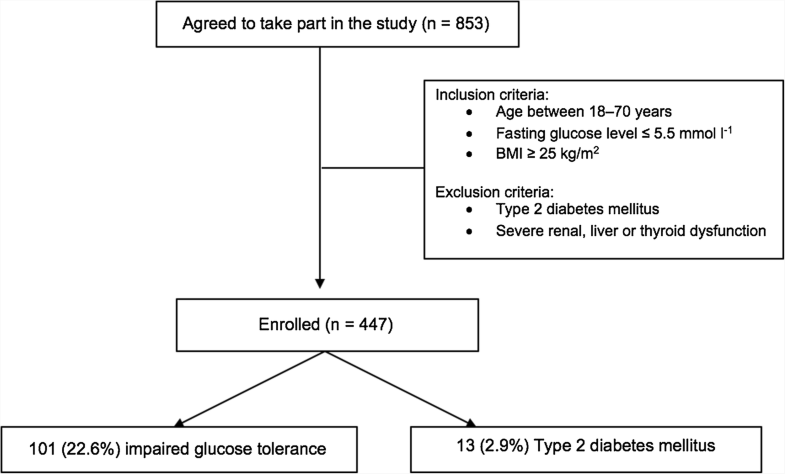 In this study, we comprehensively phenotyped a large cohort of patients with overweight and obesity and found that despite having normal fasting glycaemia the prevalence of post-prandial glucose intolerance or frank T2DM was surprisingly high at 26%. We also demonstrated that readily performed anthropometric measurements including neck circumference, waist-to-hip ratio and waist-to-height ratio were strongly correlated with post-prandial hyperglycaemia independently of fasting glucose level, smoking and physical activity level. Such measurements could therefore be used in standard clinical care to select patients with overweight or obesity that are most likely to benefit from an OGTT. Indeed, the combination of 1-h post-prandial glucose and anthropometric measurements could be used as an even better predictive marker of impaired glucose tolerance and T2DM compared to the full 2-h OGTT. BMI is the most frequently used tool for the diagnosis and classification of obesity, but it is only a surrogate measure of body adiposity and does not provide an accurate measure of body composition [7–10]. Body adiposity index is another measure of total adiposity which has been shown to correlate strongly with body fat percentage measured by dual-energy X-ray absorptiometry . Even though BMI and body adiposity index were associated with post-prandial hyperglycaemia, anthropometric measurements of central fat distribution were better predictors. These results underscore the importance of central obesity in the development of abnormal glucose metabolism and T2DM for adults with normal fasting glycaemia. Our findings are consistent with previously reported associations between body fat and prediabetes as well as the predictive value of abdominal fat distribution for T2DM and cardiovascular risk beyond that explained by traditional cardiometabolic risk factors) [11–13]. 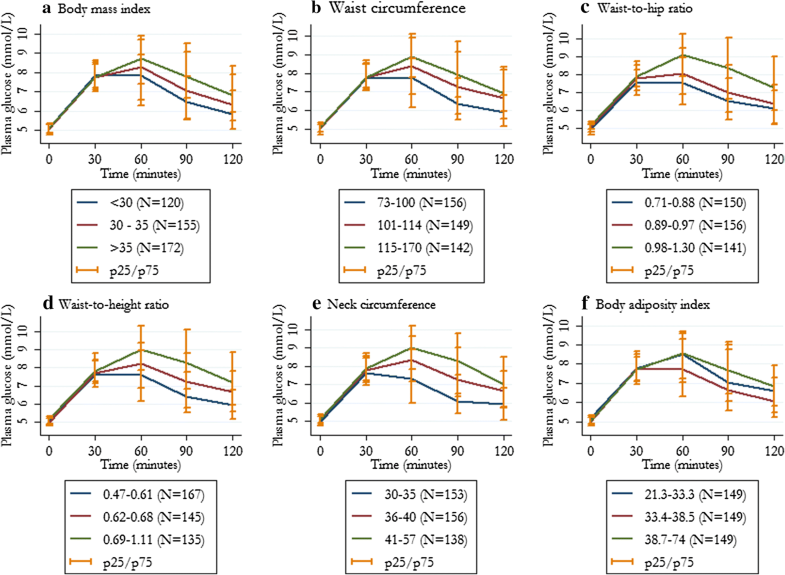 In our study neck circumference, waist circumference and waist-to-height ratio showed the strongest correlation with post-prandial hyperglycaemia independently of fasting glucose level, smoking and physical activity level. Out of all anthropometric measurements, neck circumference correlated most strongly with post-prandial hyperglycaemia in both genders but even more so in men whereas this gender interaction was not observed in the other anthropometric measurements. Neck circumference is a surrogate of upper-body subcutaneous fat depot and has attracted attention as a new independent risk factor for cardiovascular disease, dyslipidaemia, hypertension, arterial stiffness and metabolic syndrome [14–18]. However, few studies have examined the association between neck circumference and post-prandial hyperglycaemia. Those studies have shown that individuals with a neck circumference in the highest tertile have an increased risk of developing T2DM relative to those in the bottom tertile, even after adjustment for other measures of adiposity [19–21]. The results from our study support the role of neck circumference as an independent marker of post-prandial hyperglycaemia. In addition to post-prandial hyperglycaemia patients in the highest tertile of any of the anthropometric measurements studied, had a significantly decreased insulin sensitivity and ß-cell function as compared with those in the lowest tertile. These findings highlight the association between central adiposity and ß-cell damage even at early stages of this pathological process. Along these lines, the 1-h glucose concentration was significantly higher in those subjects with the highest total and central adiposity and identified those with impaired beta-cell function, insulin resistance, and worse cardiovascular risk profile. Recent population-based studies have consistently shown that a 1-h post-OGTT glucose value over 8.6 mmol l−1 (155 mg dl−1) is a better predictor of incident T2DM, associated complications and mortality than fasting or 2-h levels [22–27]. These findings are of clinical importance as they suggest that the combination of 1-h post-prandial glucose and anthropometric measurements could be used as better predictive markers of IGT and T2DM compared to the full 2-h OGTT. Such an approach could not only reduce the number of patients undergoing OGTTs but also the number of glucose samples taken thus minimizing demands on resources. As this study is cross-sectional, cause-effect relations among the degree of obesity assessed by anthropometric measurements and post-prandial hyperglycaemia and other cardiometabolic parameters cannot be established. The absence of prospective follow-up did not allow us to establish whether high values of anthropometric indices predicted the development of T2DM or the occurrence of major cardiovascular events. This was a single centre study so the results may not be extrapolated to other populations e.g. of different ethnic or socioeconomic backgrounds. Theoretically a potential selection bias could be present as the participants were not recruited randomly from the community but from patients attending a specialist clinic for nutritional interventions. In this large and comprehensively phenotyped cohort, one in four subjects had post-prandial hyperglycaemia despite normal fasting glycaemia. This highlights the importance of performing an OGTT as static normal fasting glycemia does not rule out post-prandial hyperglycaemia in this population. As an alternative to resource demanding OGTTs, there is an unmet need for readily available and inexpensive markers that can be used to screen patients that are most likely to have post-prandial hyperglycaemia and therefore benefit the most from an OGTT. In this study, anthropometric indices of central fat distribution were strongly and independently associated with an increased risk of post-prandial hyperglycaemia. These results support the association between central adiposity and the development of glucose derangements and demonstrate the clinical usefulness of anthropometric measurements as screening tools for the selection of patients who are most likely to benefit from an OGTT. BP-P wrote the manuscript and collected data. JMN-C advised on statistical analysis and reviewed the manuscript. JE, CS and JS contributed to the data collection and patient care. JE and GF contributed to the study design, data interpretation and coordinated the study. GF obtained the funding to carry out the study. All authors contributed to writing or reviewing the paper and gave their approval to the final version of the manuscript. BP-P is the corresponding author and guarantor of this work and, as such, takes full responsibility for the work as a whole, including the study design, access to data, and the decision to submit and publish the manuscript. All authors read and approved the final manuscript. The authors thank all of the members of the Department of Endocrinology & Nutrition (Clínica Universidad de Navarra, Pamplona, Spain) for their technical help. The experimental design was approved, from an ethical and scientific standpoint, by the Research Ethics Committee of the University of Navarra. Written consent was obtained from all participants prior to participating in the study. This work was supported by grants from the European Structural and Investment Funds-European Regional Development Fund, Institute of Health Carlos III (FIS-FEDER-PI16/01217 and FIS-FEDER-DTS17/00174; Integrated Health Service Plan I+D+I/2013-2016) and the Biomedical Research Networking Center for Physiopathology of Obesity and Nutrition (CIBEROBN), ISCIII, Spain. Trial registration: ClinicalTrials.gov NCT03506581. Registered 24 April 2018—Retrospectively registered, https://clinicaltrials.gov/ct2/show/NCT03506581. 12967_2019_1787_MOESM1_ESM.docx Additional file 1: Table S1. Adjusted mean 2-hours plasma glucose concentrations after a 75-g oral glucose tolerance test by categories of anthropometric measurement.